Early last week, the Yale endowment, one of the nation’s largest college fund, reported an annual return of 28% from its investment for the fiscal year ended June 30th. According to YaleDailyNews.com, the Yale endowment has returned 17.8% annually over the past decade (in 2000 the fund returned 41%), leading other large rivals such as Harvard and Princeton. So what can we learn from Yale’s staggering return? The answer, I found, is diversification. 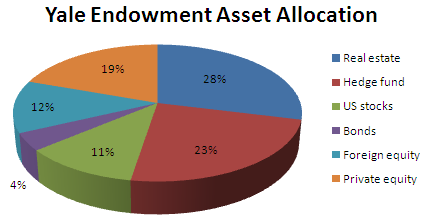 Let’s take a look how Yale endowment allocates its investments. The following is the asset allocation chart generated according to an article on International Herald Tribune (see also a NY Times report). The fund’s largest holding is real estate (28%) which includes investments in timber and property. The second largest asset category is hedge fund (what Yale called Absolute return) at 23%, followed by 19% stake in private equity. The three largest asset classes are considered as alternative asset classes. Despite recognizing that the U.S. equity market is highly efficient, Yale elects to pursue active management strategies, aspiring to outperform the market index by a few percentage points annually. Because superior stock selection provides the most consistent and reliable opportunity for generating excess returns, the University favors managers with exceptional bottom-up fundamental research capabilities. The debate between passive and active has been going one for a long time. For small investors like you and me, the conventional wisdom is to go with low-cost index funds and stay away from actively managed funds because of their higher fees and inconsistent performance. The reason Yale can use the active management approach is that it’s backed by their massive assets (total $22B) so they can negotiate a better price when investing and heir talented managers to find attractive investments. That’s not the case for us. 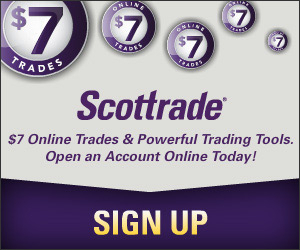 We don’t have the leverage and can only use whatever is available on the markets and pay the price everybody is paying. While cost is always one of the biggest concerns when choosing which fund to invest, there are quite some fund managers with proven track record out there and the funds they are managing have delivered above-the-average returns at reasonable costs. Should we avoid those funds all together? I myself use a lot of actively managed funds in my taxable investments. I don’t expect these funds to beat the market year-in and year-out. If the fund outperforms the index this year by 20%, I won’t be bothered if it lags the average by 18% next year. It’s fine for me as long as over time the average return acceptable (I don’t really know what an acceptable return until I have it). Indexing is simple, but that idea isn’t getting more popular these days and there must be a reason. Investments in overseas markets give the Endowment exposure to the global economy, providing substantial diversification along with opportunities to earn above-market returns through active management. Emerging markets, with their rapidly growing economies, are particularly intriguing, causing Yale to target more than one-half of its foreign portfolio to developing countries. Overall, the Yale endowment earned the top ranked return with a well diversified portfolio. For us small investors, hedge funds and private equities may not be within our reach, but we can still build our own portfolio that include alternative investments and go beyond the nation’s border. There is one major factor in the Yale portfolio that we can’t reproduce — the 100+ year timeframe. Because the average person has a 30 year horizon for retirement, investments must be pretty liquid. An endowment though can invest in illiquid vehicles which may have higher returns — the premium for being able to lock up money for long periods. MossySF beat me to it. I don’t think looking at the asset allocation of endowments like this is at all useful for individual investors for the reason mentioned – time horizon. If Yale’s managers screw up on an investment choice, they have essentially forever to recover. Not so you and me. Also how does one “value” real estate. There are people living in homes in CA right now who think its value is $1.2M when the market price is $900K. It could drop to $700K in 12 months. How would Yale mark that? $1.2M? If I could mark 1/4 of my portfolio to my liking I could do well too… i.e. yes that property bought in Chile, worth $X last year, I am going to say its worth $X x 1.08% this year. There ya go, 8% return! Easy. We can look to the TIAA-CREF Real Estate Annuity account for clues. It holds direct ownership in property and does full appraisals annually with estimated appraisals quarterly. I’m guessing because this fund holds so many properties, they have to do batches of appraisals every week. So if property prices go up/down, they can only update the prices for 1/50th or 1/100th of total holdings. This creates the illusion of lower volatility because even if the entire market went down 2.5% that day, only the 1/50th reappraised would impact the daily NAV. One more major advantage Swenson has that we cannot reproduce — as an endowment, all transactions are tax free. So Swenson can rebalance to his heart’s delight often rebalancing daily. No taxes — enough money clout to reduce transaction expenses. While I agree with you that the biggest difference between the personal investment and the endowment is the investment time frame, the goal should be the same for the two: maximizing the return. The endowment got the extraordinary return by diversifying the investments and taking more risk. That’s the concept we can use, even though we don’t have that long time frame. Investing in a total stock market fund and a total bond fund is the simplest strategy, but we may not get the return that we hope we can get. Recently, I attended a presentation about endowment investment management. I saw graphs sharing the same information. I concluded that there are, as there always have been, inefficiencies in the market (perhaps not the US stock market which can be exploited by the savvy investor. However, it involves having the right knowledge, good analysis, and doing a lot of hard work, which the average investor can’t do. For example,I would guess that there are endowment funds buying up “sub-prime debt” for literally pennies on the dollar. Even if it only rises to 25 cents on the dollar, they will have made lots of money. Real estate is also another area for potential great gains, if one is sufficiently capitalized. This is truly the time of opportunity where one can find underpriced investments A good cautious approach is to not risk too much and turn the investment into a gamble. Perhaps no more than 5-10% of one’s total investments. Your pie chart is materially wrong. Not only does it not total out to 100, but the real estate portion should be titled “Real Assets.” This is misleading as the majority of that sector position is primarily in commodities not real estate.